Born in 1950 in Allentown, Pennsylvania, Tom comes from a family of professional artists including his father Allen F. Hermansader, their cousin, John B. Hermansader, an Art Director for an advertising agency in New York City and an art restorer; John’s daughter, Marcy Hermansader, a professional artist working and residing in Vermont; and Eleanor N. Murray, nee Hermansader, an art teacher in Chicago. Tom’s father specialized in portrait painting and art restoration. At about 3 years of age, Tom remembers sitting and watching him draw and paint. That was when he knew that someday he would be an artist just like his dad! 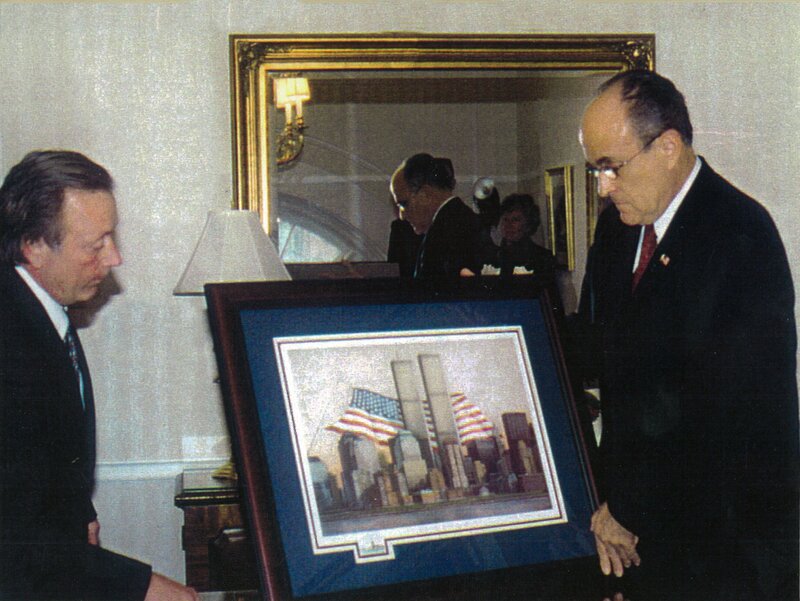 With encouragement and guidance from his parents, Tom took art classes at the Baum School of Art in Allentown and enrolled in as many art classes as possible at South Mountain Junior High School and Louis E. Dieruff High School, both in Allentown, Pennsylvania. After graduating from high school, Tom enrolled in evening classes at the Samuel S. Fleisher Art School and the Pennsylvania Academy of the Fine Arts, both in Philadelphia. 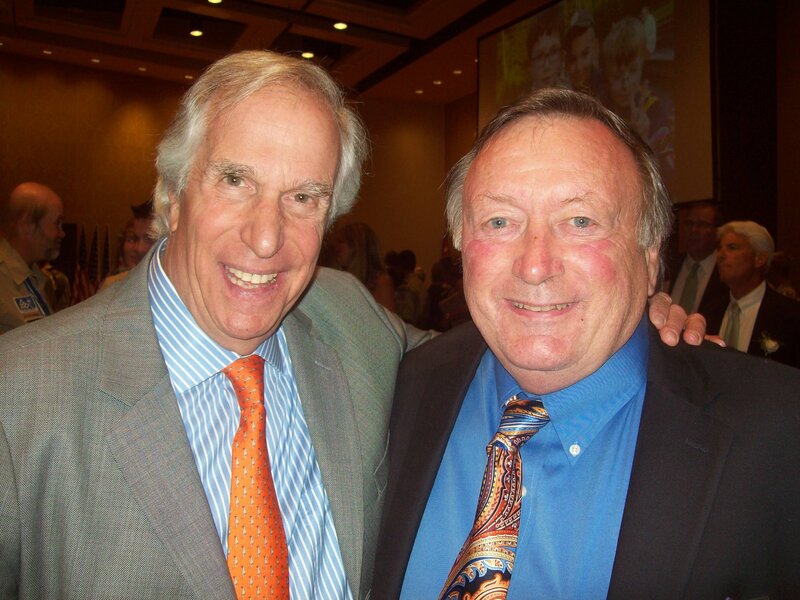 In 1969, Tom was accepted to Kutztown University and graduated in 1973 with a Bachelor’s Degree in Art Education. 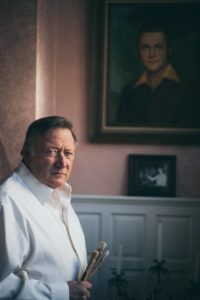 While student teaching at William Allen High School in Allentown, Tom was placed under the tutelage of artist and art teacher, Jim Musselman, a watercolorist whom he greatly admires. 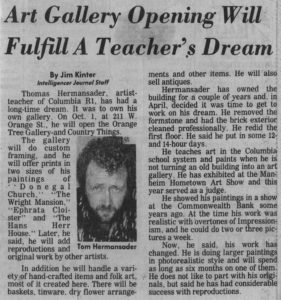 In 1978, while teaching art at Columbia Jr. – Sr. High School in Columbia, Pennsylvania, Tom earned his Master’s Degree in Art Education. In 1981, Tom produced his first limited edition print entitled “Wright’s Mansion,” which was a huge success. Tom left teaching in 1989 and since then has produced 160 limited edition and open edition prints. He has had several one-man shows, has been involved in several local art shows, and has won various art awards. Tom also paints commissions, restores artwork, and participates in fundraising. 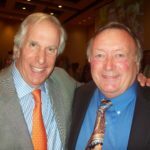 Over the years, Tom has displayed his work in a variety of galleries, while also conducting art classes. 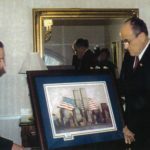 In 2008, Dr. F. Javier Cevallos, President of Kutztown University, presented Tom with the Kutztown University Alumni Association’s Rothermel Award. This award, presented to less than 1% of the graduates, recognizes the notable and distinguished achievements of alumni in their professional lives. 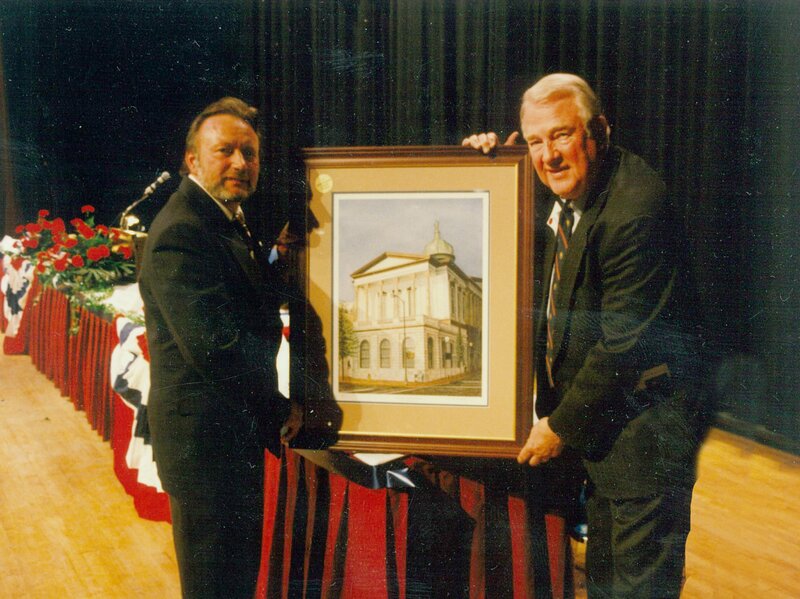 In 2009, Leo Lutz, Mayor of Columbia, Pennsylvania, awarded Tom with Columbia Borough’s Outstanding Citizen Award. Tom is also on Kutztown University’s board of directors. Tom was also voted “Favorite Local Artist” by Lancaster Newspaper’s Reader’s Choice Awards. 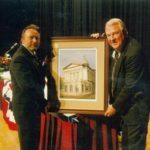 Tom’s artwork can be seen in numerous homes, hotels, banks, restaurants, and corporate and professional offices throughout Lancaster County and beyond, including the Pennsylvania State Capitol. Tom’s artwork is also in private collections of professional sports figures like Bill Bergey from the Philadelphia Eagles. 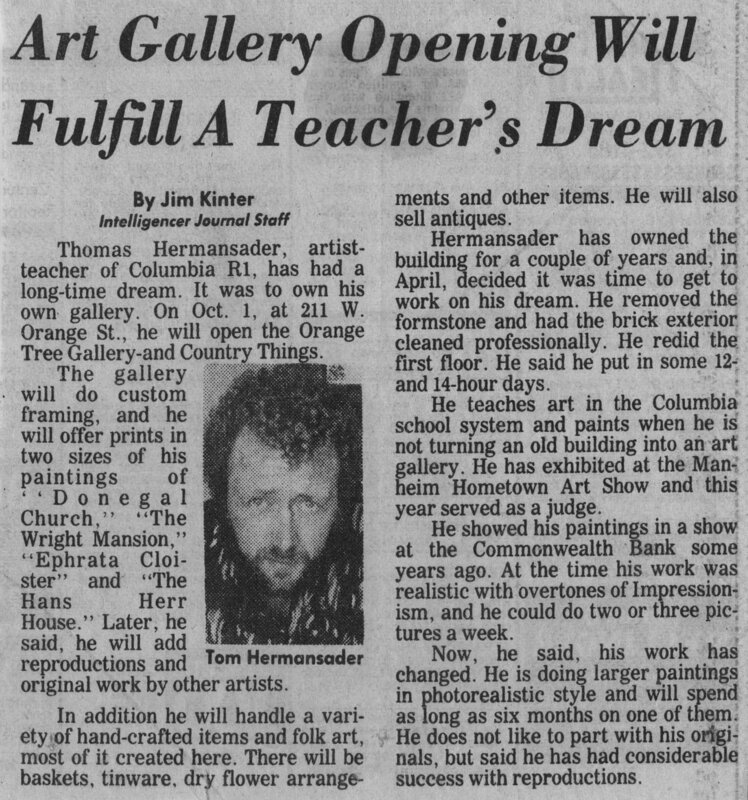 Tom operates his wholesale and retail art business at Hermansader’s Victorian Mansion and Art Gallery in Columbia, Pennsylvania. His prints are available for purchase online.